Recently a new generation of P2P systems, offering distributed hash table (DHT) functionality, have been proposed. These systems greatly improve the scalability and exact-match accuracy of P2P systems, but offer only the exact-match query facility. 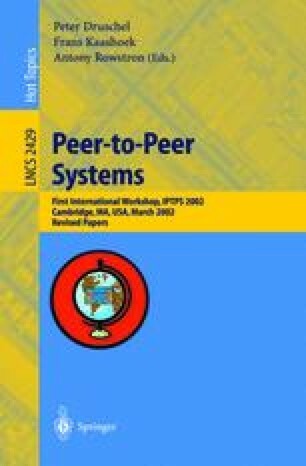 This paper outlines a research agenda for building complex query facilities on top of these DHT-based P2P systems. We describe the issues involved and outline our research plan and current status. Haas, P. J., and Hellerstein, J. M. Online Query Processing: A Tutorial. In Proc. ACM-SIGMOD International Conference on Management of Data (Santa Barbara, May 2001). Notes posted online at http://control.cs.berkeley.edu.